The A3PN250 FPGA Breakout Board is designed to be a foundation for other projects here at Skywired. 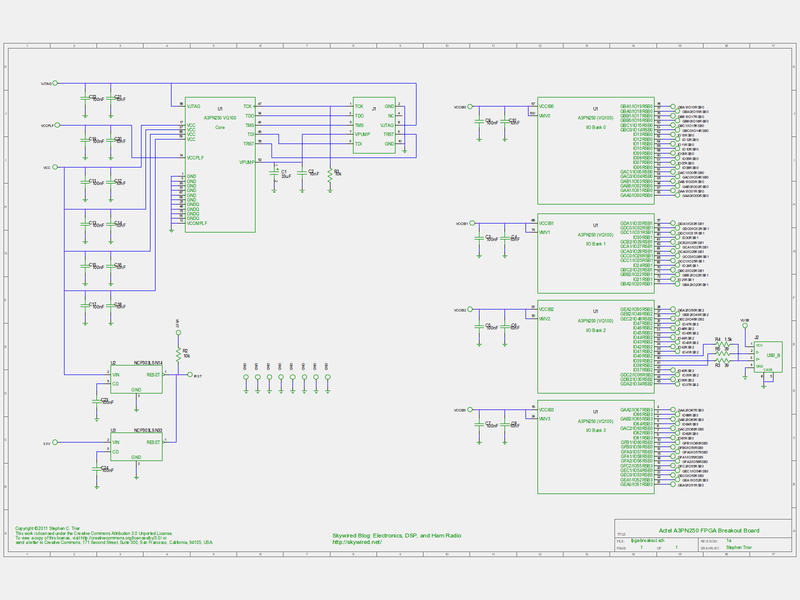 Unlike many FPGA development boards, the breakout board is designed to constrain the function of its ProASIC3 nano FPGA as little as possible, and as a result carries only a few additional components. Uniquely, it is designed to be placed on top of a copper-clad ground plane as a component in larger skywired projects. The breakout board is an ongoing project. 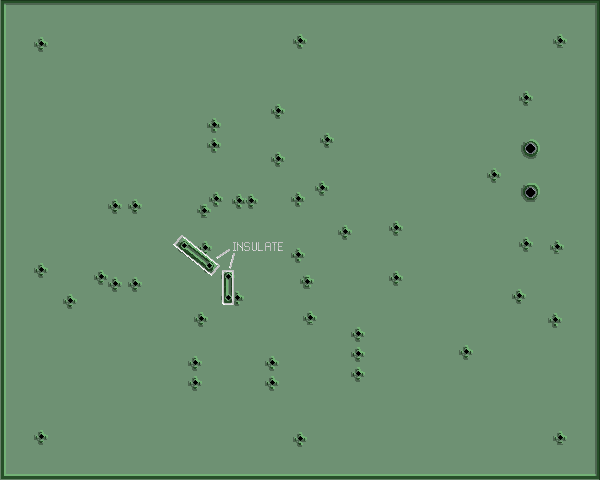 The resources below will evolve as the project matures. 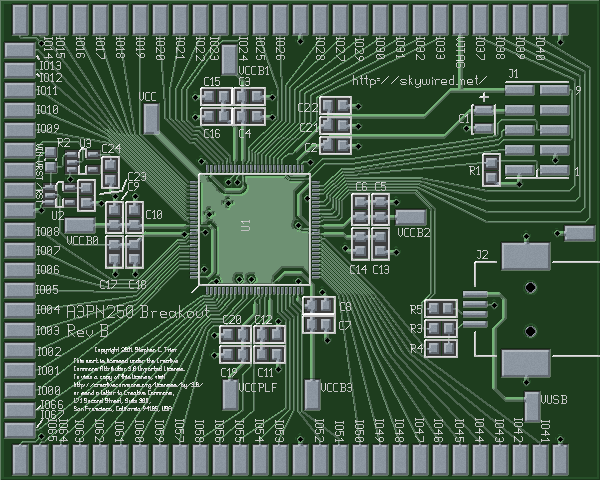 A3PN250 Breakout Board by Stephen Trier is licensed under a Creative Commons Attribution 3.0 Unported License. Warning: This revision has errors, which can be worked around. However, corrections may be desirable before fabricating a PCB of your own. Designed for Microsemi SOC (formerly Actel) A3PN250 and A3PN250Z (ProASIC3 nano) in VQFP-100. Can also break out A3P250 (ProASIC3) in VQFP-100. May be adaptable to other ProASIC3 FPGAs. Can be mounted directly on a ground plane. Two on-board voltage monitor/reset chips. One uncommitted, but typically used for an I/O supply. Designed for OpenCores USB 1.1 controller and PHY (12 Mbps). Your FPGA kit was really small! I have big size kit from big company. Your kit was really cool! What was the cost of that. Thank you! The FPGA is about $15 in single quantity, and I had the boards made by Laen’s PCB order (now called OSH Park). The price for the boards is $5 a square inch for qty. 3, which works out to something like USD $25 for three. (Plenty of other vendors can make the boards as well.) You will also need to supply the other miscellaneous components, particularly the power supply decoupling capacitors. Finally, it’s small in part because there is no on-board programmer, so you’ll need an off-board programmer like a Microsemi FlashPro 4. Some third-party programmers, or maybe even a Bus Pirate or the like, might work, but I haven’t tried them. I’d consider selling kits if I thought there was a market for at least 100. In the meantime, you’re more than welcome to download the board art, order some boards, and build up your own. If you do this, please let me know how it goes! Now I just need to find a reasonably cheap programmer and the FPGA fun can begin.